Midnite City’s Self Titled Album To Be Released October 20th – Rockposer Dot Com! 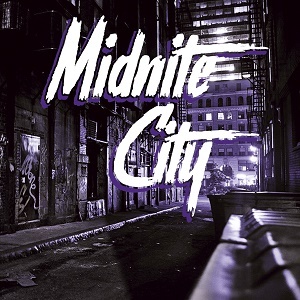 Midnite City were formed in January 2017 by current Tigertailz front-man Steevi Jaimz and Teenage Casket Company member and songwriter) Rob Wylde. Armed with an album’s worth of material written under the working title of Midnite City, Wylde approached friend Pete Newdeck (Newman/ Eden’s Curse, Blood Red Saints, Neon Strip) to produce three songs for him to shop to record labels. Wylde sang, played guitar and bass on the recordings whilst Newdeck played drums, provided backing vocals and took care of the production. Wylde also brought in newcomer guitarist Miles Meakin who played guitar solos on the recordings and former band mate James Martin (Vega) who laid down keyboards on the tracks. After being mixed by Newdeck, the songs were sent to Harry Hess (Harem Scarem) who mastered them at his studio in Canada. The songs ‘Nothing’s Like Losing You‘, ‘Summer Of Our Lives‘ and ‘Think About You‘ were then sent out to labels and garnered considerable interest across the board, resulting in a deal being inked with German label AOR Heaven. With a record deal in place, Newdeck officially joined the band as drummer in the Spring of 2017, alongside Miles Meakin on guitar and Shawn Charvette on keyboards.With the line up now in place, the band began work on their debut album at PNP Productions in Tewkesbury UK, completing the recordings in June 2017. With a sound that the band describes as ‘Timeless, melodic rock/ hair metal’, Midnite City cover all bases when it comes to this much loved genre of music. From ultimate feel good, party rock anthems, to brooding melodic rock monsters, to spine tingling power ballads, they are all here in abundance, and then some. With an album release being planned for October20th, 2017, Midnite City will be taking their explosive live show out on the road throughout the UK, Europe and the USA in late 2017/ 2018.